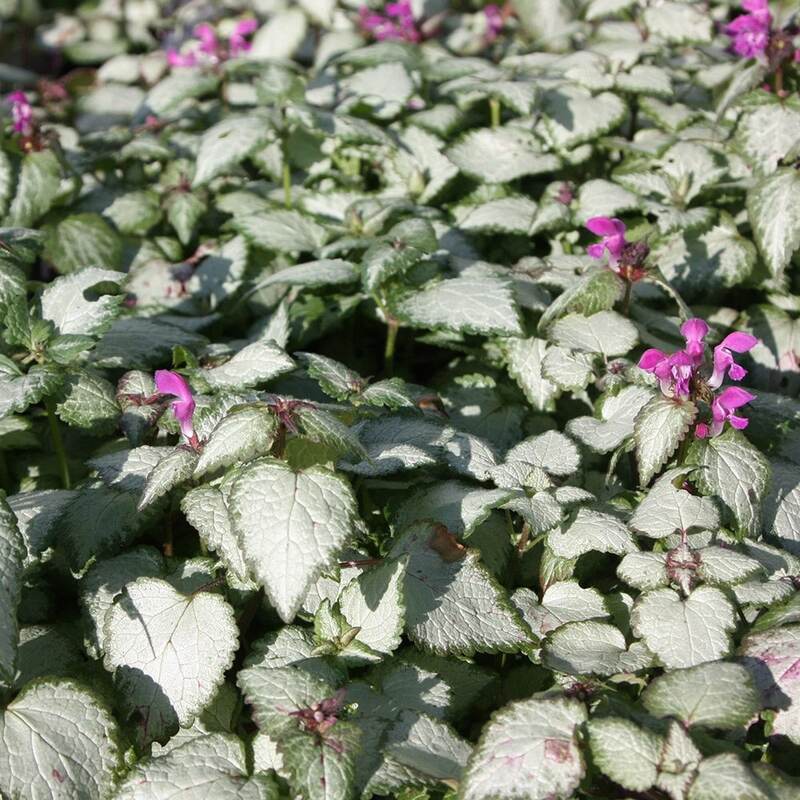 Delicate silver leaves, narrowly edged in green give this lamium an ethereal quality. It quickly forms a silvery carpet of foliage with whorls of long-lasting, nettle-like, magenta flowers in late spring and early summer. A beautiful groundcover plant that will light up the base of deciduous or even evergreen shrubs and trees. It prefers partial shade, and once established, will even flourish in difficult areas of dry shade. Garden care: If you are growing this in dry shade, keep it well watered until it is established. After it has finished flowering, remove the faded flower heads to encourage fresh new foliage. Lift and divide large clumps in late autumn or early spring. I used this plant to put some light into the shade from an apple tree. 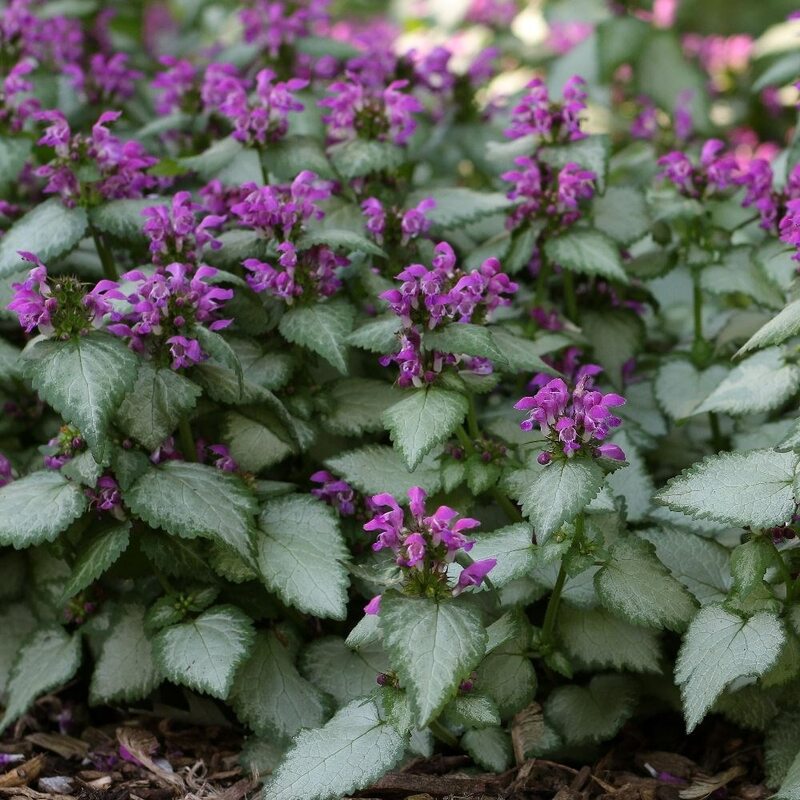 Used in a narrow, shady border by patio, shaded by fence. Has really established well and in a very hot summer took more sun than usual. i bought this plan 3 years ago and planted out as per instructions, light shade and good humus rich loam, it did not thrive in fact it seemed to die, left it where it was for a year then during a garden make over I must have dug it up by accident and it ended up in an area sandy soil and full sun. I noted the next year that a "plant" had started growing where I had dug over...within a year it had morphed in a lovely flower covered plant which spread so quickly I managed to split it three times. Already this year all three plants have spread to about 30cm x 30cm and is filling the gaps between them. it seems to be bulletproof flowering through the recent terrible storms. I intend splitting them again this year and filling all the gaps as they are real bee magnets. A garden star in my opinion. I meant bergenias not begonias!!! I planted these in a tapestry border which never sees the sun. They have been wonderful, spread to about 80cms in a few weeks and have flowered all winter. The silver leaves are a wonderful foil to hardy geraniums and begonias which grow taller and the pinky purple flowers are very pretty. Hello, Yes, the vast majority of bulbs will not have any trouble at all pushing through this, and as it is a fairly robust and fast growing plant, it wont mind the competition. Hello, we have an area under a large silver birch which is a obviously dry and shady and I'm looking for some ground cover. To add to the dilemma, there are already lots of beautiful bluebells in the space. Is there anything else I can put in which will not strangle the bluebells? Was thinking maybe lamium, but its peak season may be the same as the bluebells which is not ideal and am worried it will out compete them. At the moment, after May/June, it just runs wild with grassy weeds which are not very attractive. Thanks for any help! Hello, There are several things that spring to mind - here are some of my favourites... Ajuga http://www.crocus.co.uk/search/_/search.ajuga/sort.0/ Pachysandra terminalis http://www.crocus.co.uk/plants/_/pachysandra-terminalis/classid.3288/ Vinca http://www.crocus.co.uk/search/_/search.vinca/sort.0/ As for the lamium, this too would be fine as although it flowers at roughly the same time as the bluebells, its attractive foliage remains for the best part of the year in most settings. I have been looking for some all year low, ground cover that will tolerate extremely dry soil under a sycamore and a chestnut. I haven not even been able to get shady grass to grow. Ivy and nettles seem to do ok, so something at least grows. Have you any suggestions? It is quite shady but not overly so, soil is mostly clay. I don't mind if it flowers or not, as long as its has some green in winter and I would ideally like it to blend into the lawn where it is patchy near the trees. Plant suggestions for a child's 'Fairy Garden' Sirs, Having recently cleared and replanted much of my garden my 11 year old daughter has asked for her own plot to create a "fairy garden". I love the idea of her looking after her own area, and she will also help, and have part of the vegetable plot. However I am stuck as to which plants (shrubs, perennials or otherwise) to suggest for the fairy garden. The plot she has selected is above the waterfall. The soil is a little heavy but other than that quite good, but it is in the shade of a large sycamore tree. Can you suggest any shade tolerant plants for this area? In case it helps, it sits next to a Japanese inspired area. The area is approximately 2m square, but if you have any ideas that might need more space that is also OK . Thank you.